Whey is a type of protein that comes from cow's milk. Although whey protein supplements and drink mixes are a quick way to consume protein, they may not be suitable for individuals with certain digestive disorders, such as Crohn's disease. Like other milk products, whey protein isolate may increase your risk of certain symptoms. Crohn's disease causes inflammation in your gastrointestinal tract. Although the inflammation may affect any part of your digestive system, it most frequently causes swelling within the bottom area of your small intestine. Diarrhea is a common symptom of Crohn's disease. 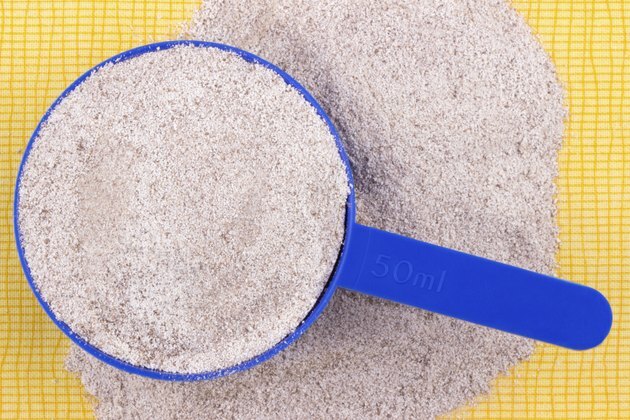 Whey protein may increase the risk of diarrhea. There are several theories regarding the cause of Crohn's disease. One of the possible reasons involves the immune system mistaking natural substances as threats, increasing the amount of white blood cells that may lead to chronic inflammation within the digestive tract. Crohn's disease is a serious disorder that can lead to weight loss and rectal bleeding. One of the major risks of Crohn's disease is the possibility of nutritional deficiencies, including a lack of adequate protein. The protein deficiency may occur due to an inadequate consumption of this nutrient, as well as the inability to absorb protein through your intestines, also known as malabsorption. While people without dietary restrictions may use whey products as protein supplements, these may not be the best sources of protein for people with Crohn's disease. Most individuals need to consume between 20 g and 25 g of protein per day. Whey protein is one of the most digestible forms of protein. Whey protein isolate is processed whey protein that no longer contains lactose or fat. The isolate form of whey protein contains about 90 percent protein. MayoClinic.com recommends people with Crohn's disease and other inflammatory bowel diseases limit dairy products. Although whey protein isolate contains no lactose, a common source of diarrhea and abdominal pain, it may increase the risk of bleeding. It may also lower your blood pressure. If you suffer from Crohn's disease, talk to your doctor before you take any type of nutritional supplement, including whey protein isolate.